This paper argues that pragmatics can yield interesting insights into the nature of paradoxes of self-reference. These insights help us understand that self-referential questions in philosophy do not necessarily lead to antinomy. First, the article summarizes the results of the traditional, formal-semantic approach to antinomies and determines which kind of attempts at resolving them has led philosophers to reject all self-referential sentences as nonsensical. Next, it presents two pragmatically-oriented attempts at solving the Liar paradox. Critical examination of these attempts makes it possible to distill the specific features of the pragmatic approach and to use these features in an analysis of several self-referential utterances. Accordingly, the paper proposes a classification of pragmatic self-reference, which is then used to analyze the argument from self-referential inconsistency against skepticism. 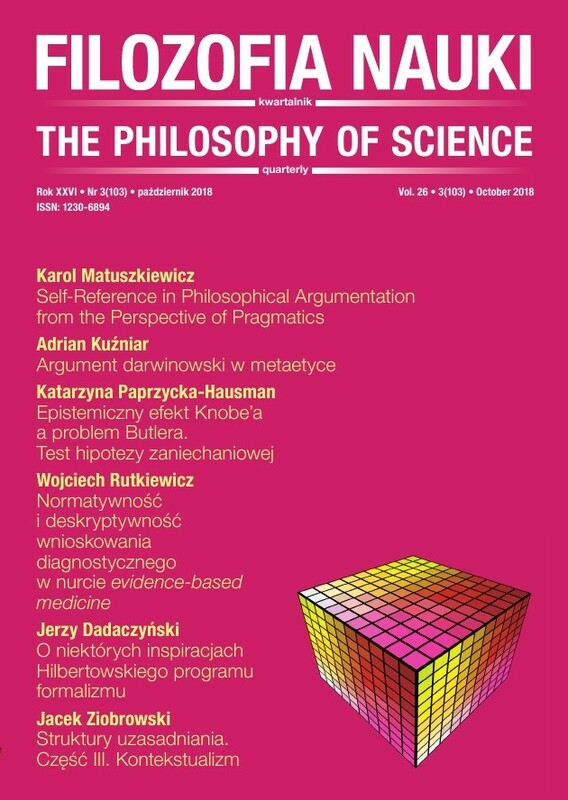 The paper closes with a summary emphasizing that, in light of pragmatic analysis, self-referential arguments in philosophy are not affected by paradox, which shows that the inadmissibility thesis is unjustified. Mackie J. L. (1973), Truth, Probability, and Paradox: Studies in Philosophical Logic, Oxford: Clarendon Press. Popper K. (1954), "Self-Reference and Meaning in Ordinary Language," Mind 63(250), 162-169. Priest G. (1979), "The Logic of Paradox," Journal of Philosophical Logic 8(1), 219-241. Russell B., Whitehead A. (1925), Principia Mathematica, Cambridge: Cambridge University Press. Scofield C. I., Rikkers D. W. (2002), The Scofield Study Bible: New King James Version, New York, NY: Oxford University Press. Tarski A. (1956), The Concept of Truth in Formalized Languages [in:] Logic, Semantics, Metamathematics: Papers from 1923 to 1938, J. H. Woodger (trans. ), Oxford: Clarendon Press, 152-278.